PHILADELPHIA – Noah Pernikoff is back to his life in New York City after becoming the first patient in the world to undergo a complex three-part, robotic-assisted surgery. The robotic arms made it possible for the multidisciplinary team at Penn to successfully remove a rare tumor from Noah's neck, where the skull meets the spine. The ground breaking surgery was completed by a multi-surgeon team, led by Dr. Neil Malhotra, at the Hospital of the University of Pennsylvania in August 2017 over a span of two days and more than 20 hours. Among his injuries from the accident, Noah–who was working in New York City for a commercial contracting firm–tore his rotator cuff and had several herniated discs. More important, however, was his post-accident nagging neck pain, which lead to an x-ray that revealed a concerning lesion in his neck, on his cervical spine. The lesion was clearly unrelated to the accident, and far more concerning than the minor injuries he had endured. After making a recovery from the accident, Pernikoff's father, a physician, encouraged his son to see a neurosurgeon for evaluation of the injury. The neurosurgeon Pernikoff saw ultimately recommended a biopsy of the spot, which resulted in a diagnosis of chordoma. Chordoma is extremely rare; it affects only one in 1 million people each year. Pernikoff's specific type of chordoma, located on his C2 vertebrae, is even rarer, making treatment a challenge. Pernikoff's neurosurgeon immediately referred him to Penn, where a multidisciplinary team reviewed his case, and his options, and began crafting a treatment plan–not through radiation, but a complex surgery that had never been performed before. "This would be a first ever use of a robot in this manner–a rare approach to an already rare and complex case," Malhotra said. "Our team needed to reconstruct the removed area of Pernikoff's spine using bone and rods, and that was only the beginning." The surgery was performed in three parts. 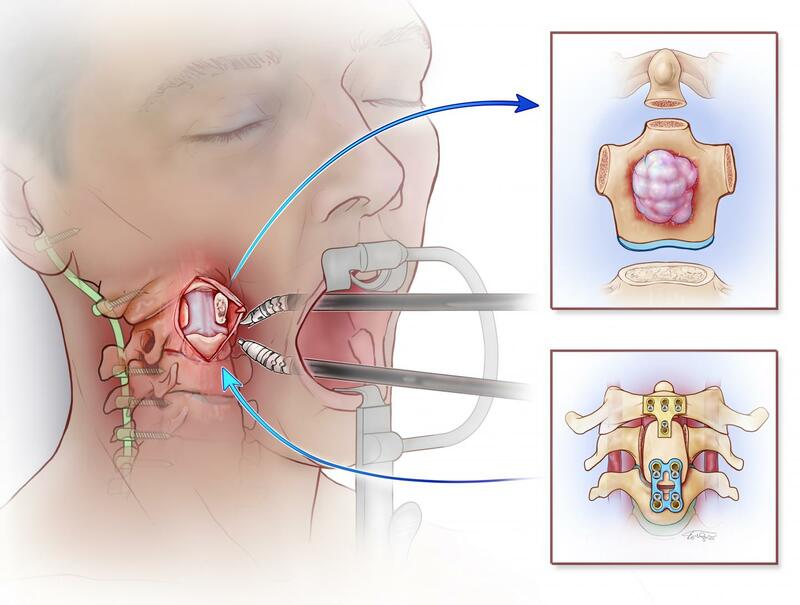 First, the neurosurgeons went through the back of Pernikoff's neck and cut the spine around the tumor to prepare for the second stage, removing the tumor through his mouth. The key to this stage would be to make ultrasonic bone cuts–removing a piece of bone–around the tumor without touching it, and without injuring the spinal cord that lay between the neurosurgeon and the tumor/spinal column. With stage one success, O'Malley and a team of three head and neck surgeons used the surgical robot to clear a path so Malhotra could remove the tumor, and part of the spinal column, in its entirety through the mouth. Finally, the team reconstructed Pernikoff's spinal column, which was now missing an important bone in his neck, using some of Pernikoffs' own bone from his hip and rods to finalize stabilization of the newly built portion of his spine.